Chris and Lisa King sit on the deck outside their Goose Rocks Beach home while two of their children, Madison and Bryanna, play nearby. 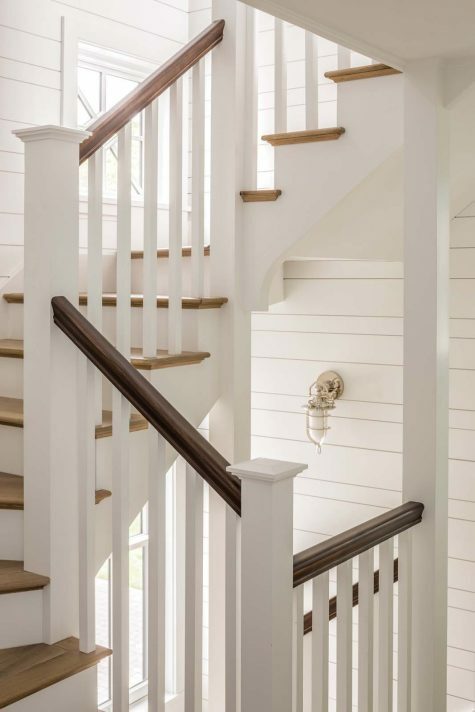 The deck railing complements the home’s nautical style. 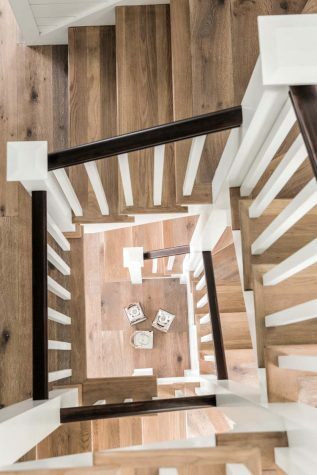 The open floor plan creates a feeling of spaciousness. Above the living area’s mantel is Allen Bunker’s oil on canvas Green Trees. 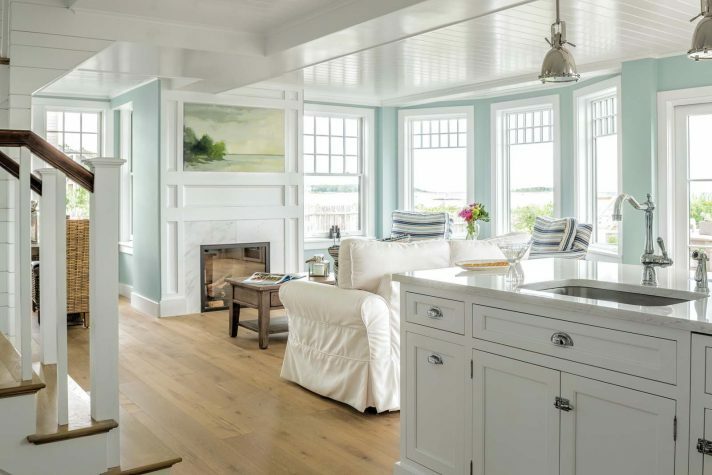 Atlantic Design Center designed the kitchen, which has many small nods to Chris’s love of yachting, including cleatshaped pulls on the refrigerator and metal latches on the cabinets. 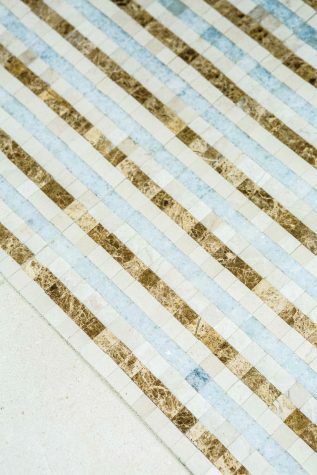 The tile design in the downstairs bathroom is by Atlantic Design Center. 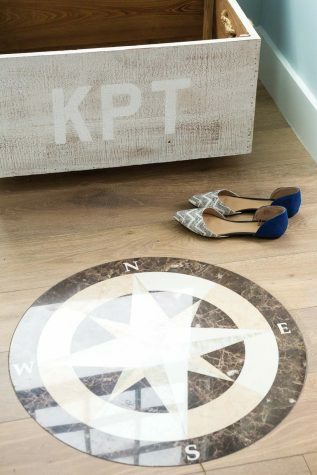 An inlaid compass rose by Czar Floors graces the first floor. For the girls’ room, the couple decided on the color combination of sea foam green and white. Extra storage is tucked under the bunk beds. 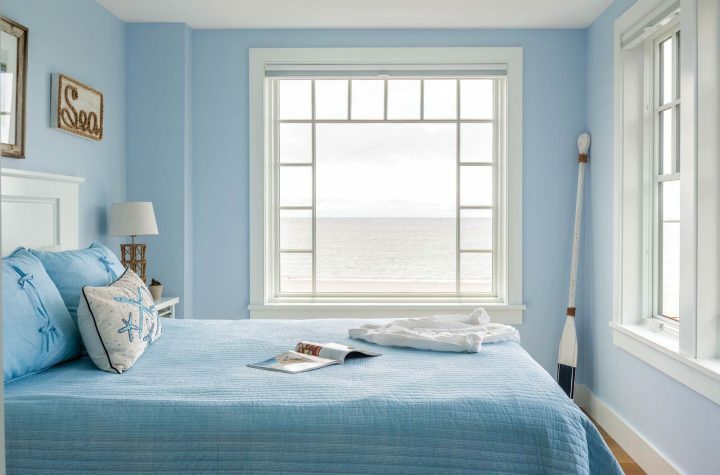 In the guest room, windows with minimal muntins provide the best possible views. 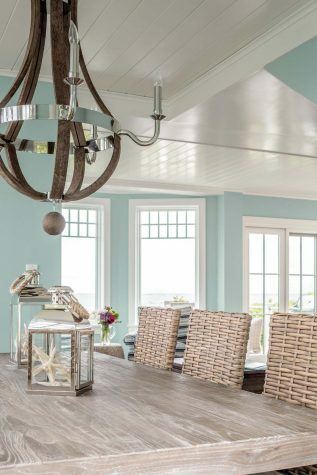 A rustic chandelier from Restoration Hardware hangs above the dining table. The view looking down from the third floor. 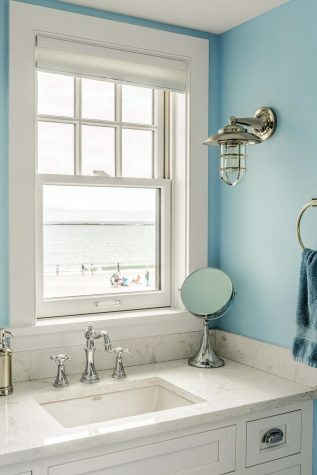 A bathroom features marble countertops and a view of the beach. The sconce is from the Lighthouse in Kennebunk. 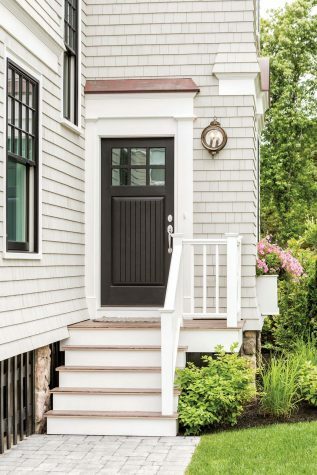 An exterior door matches the black of the Pella custom windows. Three years ago, Lisa and Chris King were walking along Goose Rocks Beach in Kennebunkport with their two younger daughters. For years, the Kings had spent their summers vacationing on their 45-foot yacht, which they docked at Constitution Marina in Boston, but they were ready for a change. They decided on a whim to take a trip to the Kennebunks. 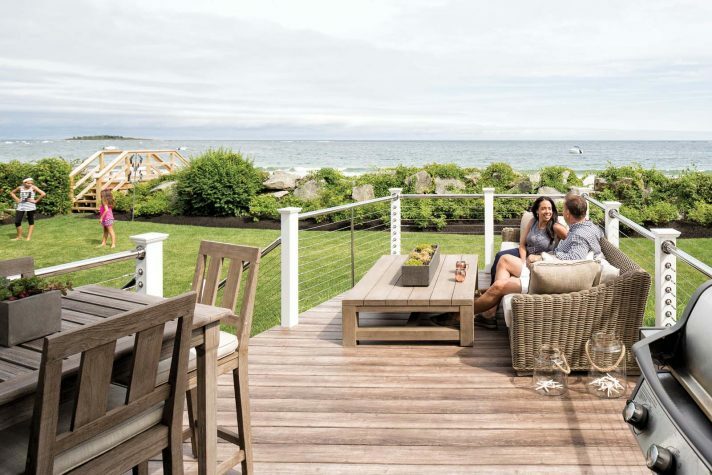 Neither Lisa nor Chris were particularly familiar with Kennebunkport, but they felt drawn to the charm of the lower village and the raw beauty of the coastline. Then, as they were discussing their home-buying options, their daughter Bryanna ran up to them with a sand dollar in hand. “She told me she found a whole sand dollar—one that wasn’t broken,” Lisa recalls. “I thought she was yanking my chain at first. But it was real. Here I was, 42 years old, and seeing my first whole sand dollar in the wild.” Even though she’d visited Florida beaches as a child, and even though she spent her summers on the Massachusetts coast, this was a new experience for Lisa. “It felt like a sign,” she says. The Kings began construction in 2014 after tearing down an existing structure. “It was a small cottage, and it wasn’t in good shape at all,” Trudo says. 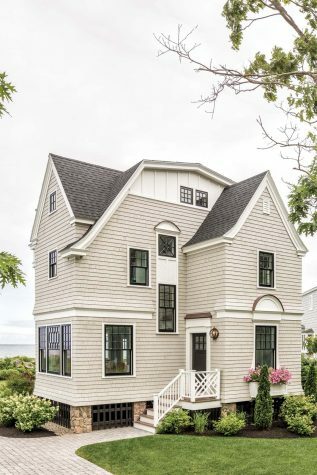 Not only was the former beach house rather dated, it was also quite cramped. The couple’s four children range in age from 7 to 21, and if the Kings were going to build a vacation house, they wanted to have room for their kids, their kids’ friends, and any other weekend visitors. including the 3-foot piers the house had to be built on because of its proximity to the water. 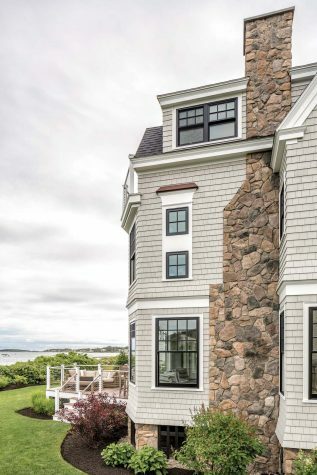 “It was a very tricky house structurally,” says architectural designer Erik Peterson of Peterson Design Group Architecture in Kennebunk, who designed the couple’s shingle-style beach house. They wanted to have three stories, which would allow room for guest bedrooms and an owners’ suite (complete with a balcony up top), as well as rooms for all four children, including Chris’s adult kids, Courtney and Kyle. 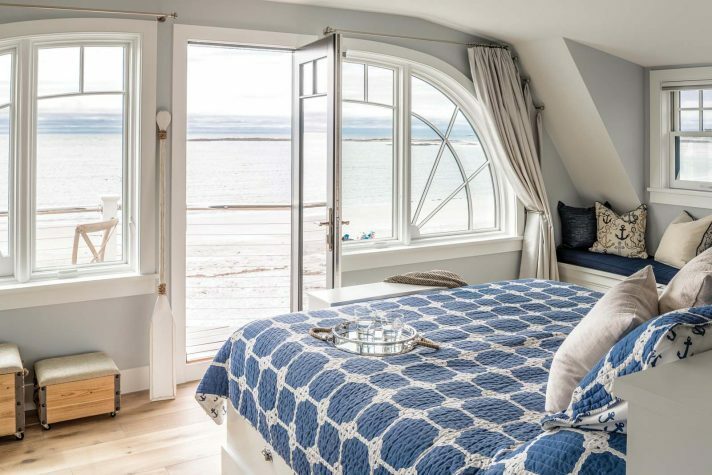 But, as Peterson explains, “Three stories in 27 feet is very, very tight.” Furthermore, the couple wanted an open-concept house to take advantage of the beachfront views and the natural light. “It was a puzzle. We had to get creative to figure out how everything would fit, but we managed to get in three and a half bathrooms and a nice owners’ suite plus the downstairs living area,” he says. could,” Chris says. “We knew we wouldn’t have space for dressers, so we put added storage under the window seat, as well as under the beds.” The second floor houses a guest room with a queen-size bed built into the wall as well as a second bunk room. “We wanted to make sure that we had plenty of places for our guests to sleep,” Lisa adds. Even though the house has a small footprint, it can comfortably accommodate up to 10, thanks to the many beds and bathrooms. Designed by Peterson Design Group Architecture, the 1,672-square-foot house features custom-made Pella windows, which are black on the outside and white on the inside. 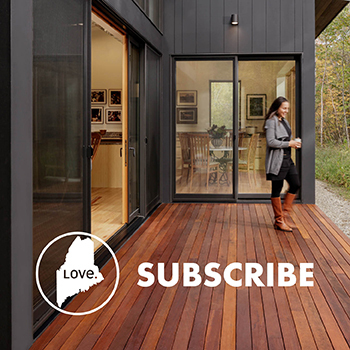 “I wanted to keep the interior clean and light,” Lisa says. 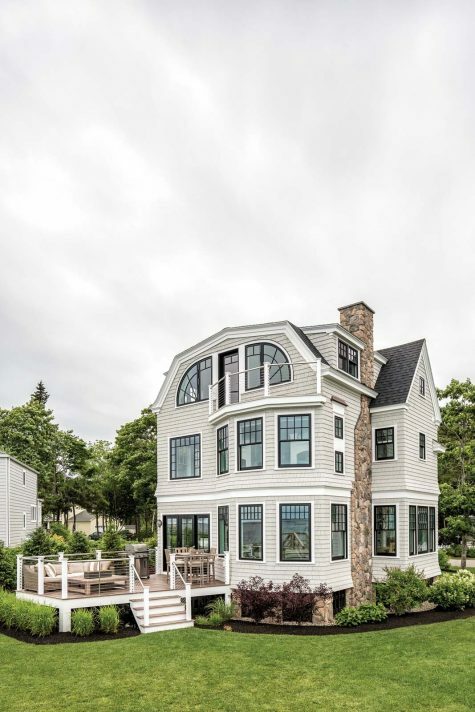 “Black window sashes wouldn’t have worked on the inside.” The landscape design is by Kennebunkport’s CL Design and Landscape. 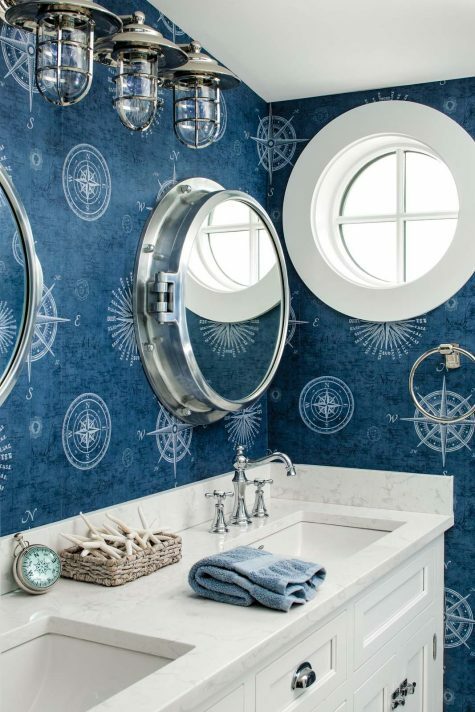 A bathroom with a nautical theme has lighting by Restoration Hardware. The house is built around a central stairway that connects its three floors.